WikipediaWhere the real Mr. Darcy once lived. The largest private house in the United Kingdom with over 250,000 square feet and 365 rooms has gone on sale for a surprisingly paltry $US11.1 million, according to The Daily Mail. 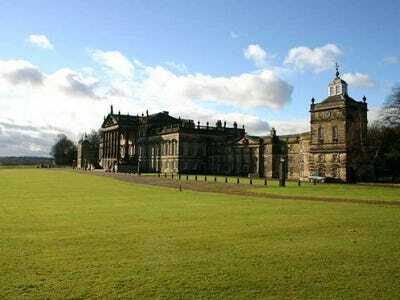 In its prime, the Wentworth Woodhouse estate was the height of aristocratic English society. It sat on the richest seams of coal in South Yorkshire just as the Industrial Revolution was taking off — and seemed to be the center of infinite wealth. Built by First Marquess of Rockingham, the home took so long to build that the eastern and western wings of the home were built in different architectural styles (the east side is early-18th century Baroque while the west is mid-18th century Palladian). It is so staggeringly massive that guests to the Wentworth Woodhouse were actually given baskets of confetti to scatter as a trail so that they wouldn’t get lost on their way back to their rooms at the end of the evening, according to The Daily Mail. The palatial Wentworth Woodhouse is steeped in history, too. The Fitzwilliam family, who inherited the estate after the 2nd Marquess died, were thought to be the inspiration behind Jane Austen’s “Pride and Prejudice.” They were the 6th wealthiest landowners in the country at the time and the 4th Earl Fitzwilliam is thought to be the real-life counterpart to Austen’s dreamy Fitzwilliam Darcy. The Fitzwilliams threw Gatsby-esque parties, and guests would sometimes meet on the train back to London to discover that they had both been in the same house party all weekend, according to the Daily Mail. But after World War II, the property was ripped to shreds by the government. There was a national shortage of coal, and the Minister Of Fuel and Power ordered the grounds of the house to be dug up for opencast mining. The house was headed for a ruin, and when the 8th Earl Fitzwilliam died in a plane crash on a scandalous rendezvous with JFK’s sister Kathleen ‘Kick’ Kennedy in 1948, the home was turned over and became a college of physical education. In 1999, the Newbold family bought the estate and have spent years trying to restore the home to its original glory. The family is now selling the estate for a reported £7 million or $US11.1 million, although it still needs an estimated $US42 million in repairs.